considered a variation on the theme. The problem with cartridge bearings is that, in order to accommodate a fatter axle, smaller balls must be used, resulting in reduced load-carrying ability and durability. The 7700 Dura-Ace group’s Octalink bottom bracket assembly addressed this by having both ball and, to take the big radial loads, roller bearing elements. While reasonably light, it is complex, tricky to install and expensive to manufacture. Simple all-in-one cartridge-type Octalink and ISIS Drive® BB assemblies with small balls have proven less durable than similar products with square-taper axles. All cartridge type assemblies suffer from having their bearings located inside the cartridge and a long way from the crank interface. By placing the bearings outboard of the shell, the Coda design put them as far apart and as close to the cranks as realistically possible, reducing bending loads on the crank to virtually nil. This was the arrangement adopted by Shimano for the original 10-speed Dura-Ace groupset of 2003. At its heart was a novel crankset turning in bearings placed in housings that screwed into the bottom bracket shell. internal diameter of 25mm. A 24mm axle needs a 0.5mm sleeve. 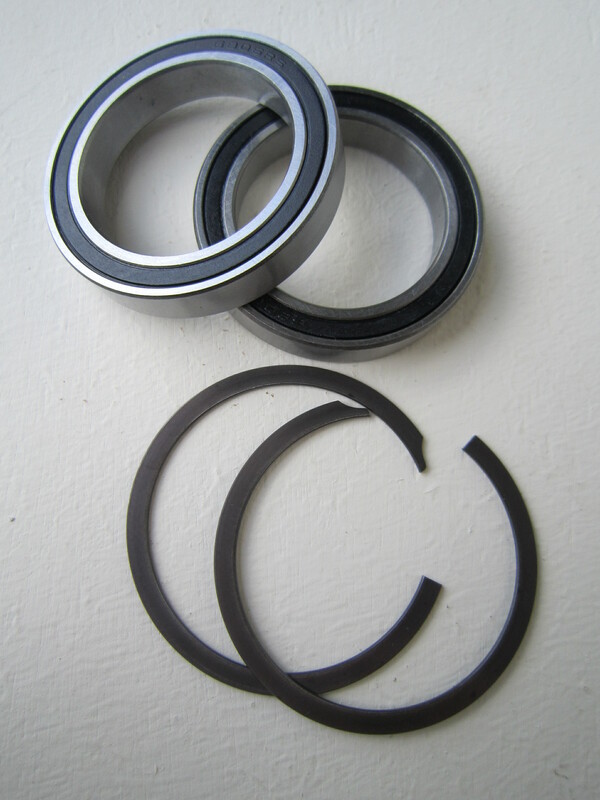 This bearing size is now the de facto standard for “outboard” bearings in external housings that thread into the bottom bracket shell. It is also used where a manufacturer offers a frame designed to take a crankset with 24mm diameter axle but fitted with net-moulded housings for 6805 bearings. Back in 1992, Magic Motorcycle’s key design innovation had been to locate the bearings outside the bracket shell, allowing them to be of larger external and, critically, internal diameter. The bearing size chosen, 6806, has a 30mm bore, which is big enough to house a durable aluminium axle. The problem for the Coda design was that the outboard aluminium housing was wider than ideal, increasing “tread”, or Q-factor, and reducing heel-to-crank clearance.